This article has been seen 12665 times. INGREDIENTS: 100% natural, wild harvested, cold pressed by wooden press Pine Nut Flakes. May contain pine nut film a rich source of silicone. The flakes of the pine nut are obtained by pressing the pine nut oil from the kernel of the pine nut. In contrast to the whole pine nut, pine nut flakes are distinguished by their increased proportional content of vitamins, trace elements, and plant proteins owing to the reduction of the fat content. In the processing of pressing the pine nut oil, 10–16% of the pine nut oil is retained in the flakes. The protein in the flakes made from the kernel of the pine nut surpasses an ideal protein in its content of histidine, methionine, cysteine, and tryptophan, and has a well balanced composition. The carbohydrate composition of the kernel of the pine nut is represented by polysaccharides (starch, cellulose, pentosans, dextrins) and watersoluble sugars (glucose, fructose, sucrose, and raffinose). The lecithin contained in pine nut flakes is a basic chemical substance for the formation of the intercellular space, the normal functioning of the nervous system, and the healthy activity of brain cells. Lecithin is essential for the organism as a building material for the renewal of damaged cells. Lecithin is also the basic transport substance for the delivery of nutrients to the cells. Flakes made from the kernel of the Siberian pine contain a high quantity of mineral substances—up to 5%, which are represented by a specific set of macroelements and trace elements. There is a high content of phosphorus and magnesium. Only 100 g of pine nut contains the human daily requirement of magnesium, manganese, copper, zinc, and cobalt. Of special interest is the pine nut as a natural source of iodine. The daily requirement of iodine is 0.1–0.2 mg, and the pine nut kernel contains on average 0.577 mg/kg of iodine. Pine nut flakes should definitely be present in the food allowance of pregnant women, children, and breastfeeding mothers (for lactation). In olden times, when milk was completely absent, children were fed with a mixture prepared from pine nut flour. 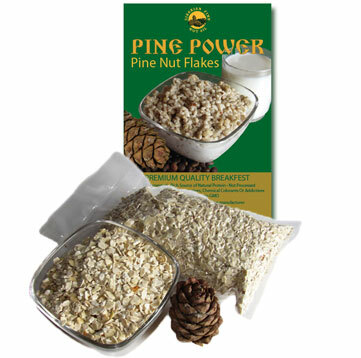 pine nut flakes are natural protein, and are extremely suitable for athletes to increase muscle mass. The flakes have a pleasant nutty taste and aroma, are easily digested, and can include particles of the membrane of the pine nut pericarp, which is rich in potassium. Pine nut flakes are used as a complement to food (in porridge, salads), as part of flourbased confectionaries, as well as a separate food product. 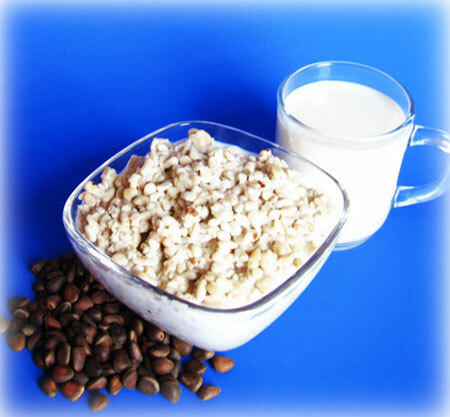 The consumption of 3–5 tablespoons of flakes a day fully provides the organism with essential components. 1. Fill the bowl with pine nut flakes. 4. Depending on the type of liquid you use, you may wish to leave pine nut flakes for 1015 minutes to mesh well with it. 1. Pine Nut Flakes Salad. In a large bowl mix together 1/2 pound romaine lettuce, 1/2 pound quartered cherry tomatoes, 1/2 pound sliced cucumbers, 1/3 cup pine nut flakes and 1/8 cup finely chopped fresh basil. Pour 34 tbsp pine nut oil and squeeze 1/2 lemon. Add salt to taste and toss well. 2. Tahini Sauce. Mix together 2 tbsp raw tahini, 1/2 juiced Lemon, 1tbsp Honey, 2 pressed garlic cloves and 2 tbsp pine nut flakes. This sauce goes deliciously with crackers. 3. Protein Milk. Makes: 47 cups. Combine 1 cup pine nut flakes and 35 cups water in a blender. You can create the desired thickness by using more or less water. Blend on high for 45 minutes. To sweeten add honey, bananas, dates, figs, raisins, maple syrup or your favorite fruit. Blend again until smooth. You can enjoy it thick or strain it through cheesecloth. Protein milk is perfect alone and with your meal. It will keep for 2 days in the refrigerator in a sealed glass container. Enjoy!